As you may or may not have heard, on Sunday February 25, Niels hosted the Gentry invitational: an eight person single elimination event that pitched top players of all four leaderboards and the reigning Open champion against each other to showcase the current state of Gentry. As you also may have heard, I got out on top, which wins me a bye in the next Gentry Open and, more importantly, the right to talk about myself in the form of a tournament report. Actually, for the latter you don’t need to win any event. You can (re)watch most matches here and I will therefore not bother you with exactly how my games played out. Instead, I will shove some of my thoughts in your general direction, thoughts on the invitational as an experience and Gentry. The Invitational’s premise is a very enticing one: bring together proficient Gentry players from all corners of the scene that would rarely battle otherwise. With a consistently good record at leaderboard events and the growing hype leading up to this event, the Invitational’s appeal began to grow on me. The fact that it was being organized at a different location, Niels’ house, with better streaming equipment, a single-elimination structure that did not leave room for any mistake or much bad luck and the secrecy of the bracket only added to the allure of the tournament. The invitational delivered in a big way. With the participants and some additional spectators we held a little viewing party downstairs, enjoying some tense matches of magic, joking around, commenting the plays on stream and commenting the commentary of course. This relaxed atmosphere was in stark contrast with the tension during our own matches. As gladiators we had to ascended the stairs to the battle arena, Niels’ attic, with only you, your opponent… and some music so you could assuredly not hear Niels stream in the room below. Still, the isolation, the lack of distractions and the bright lights of thirty-ish Twitch viewers watching, invoked focus and a certain competitiveness in me. Indeed, after each match I caught myself being more invested, mentally and emotionally, than I thought I would. And I liked it. Since I almost exclusively play Gentry as constructed magic, my past endeavors in our beloved format characterize my style as a magic player better than anything. UR sphinx’s tutelage, UR eldrazi, UWtempo value (Whirler Rogue, Reflector Mage and Topan Freeblade), UR thopters and even UR Rise from the Tides: all of these deck can be categorized as ‘proactive negate decks’ and all of these were once piloted by this happy camper. They all have a solid engine, develop their own proactive plan towards victory (even Tutelage and Rise from the Tides were built to draw blisteringly fast through your deck to either mill your opponent or summon 8+ zombies). All these decks play blue and can, therefore, include negates in the sideboard to protect your engine from anything that dares to touch it. It is surprising in how many match-ups negates have been relevant, especially but not exclusively against slower decks where it enables you to dictate the pace of play by stopping disruption at key moments. Maybe an even bigger advantage of playing blue, is that it often offers good card draw. You see, good card draw gets out of hand pretty fast since your first copy of card draw digs you deeper to your next copies. This standard season, we have access to Cloudblazer">Cloudblazers to draw you a train of additional Cloudblazers. And that is where my choice of deck starts. You can see my complete decklist here, so allow me to elaborate a bit on my card choices. Cloudblazer is an excellent card: you get two cards attached to a 2/2 creature (these days everything is attached to creature) with evasion and even two extra life for only five mana. Now, imagine this card at 4 mana AND getting you a vigilant warrior token, and you are dealing with some serious nonsense. Fortunately, that is exactly what Oketra’s Monument allows you to do. Furthermore, Oketra’s monument plays well with casting many other creatures, something Cloudblazer">Cloudblazer enables you to do. So, we have good card draw and an engine. Let’s get this train rolling. The supporting cards are nothing to scoff at. Legion Conquistador gives you additional card advantage, but goes crazy with a monument to The True. Aven Wind Guide lifts your tokens above inevitable board stalls, while also being a natural two for one in most cases. Aviary Mechanic is the next all-star in this deck. 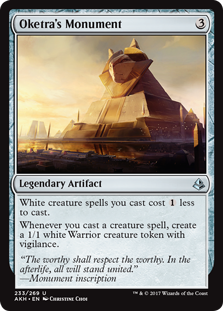 Its ceiling is getting an unending stream of tokens only costing one white mana for each Oketra’s monument trigger, while its floor is being a respectable 2/2 for two mana. 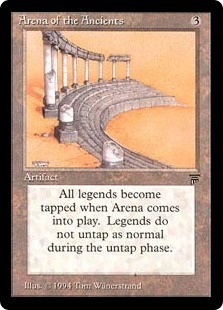 In between you find a whole spectrum of re-using ‘Enter the Battlefield’ type triggers, retriggering the monument and sometimes even replaying lands. The deck is rounded out by some excellent rares and Trial of Solidarity to give your swarm a very explosive punch. I have been playing playing this deck from even before rotation, yet I am still enjoying myself. Taking your turn three off to explosively flood the board on the subsequent turns is just something… magical (ba dum tss). I will not talk about my quarter final but I will recommend you to at least watch the quarter finals of Aron and Thijs, easily my pick for match of the day. It is a marathon of a match but with high-quality plays, vigorous thinking and fifty different shades of commentary by Niels. The stretched-out first game is the highlight with Thijs fighting a seemingly unwinnable battle, showing why you should play every game to the bitter end. I do want to note that in most tournaments, rounds in are timed and I advice you against taking more than an hour for the first game. Easily level 3 spaghetti. Not more to say except that it is a significant reason to qualify for future invitationals. Even a small uproar over how to cook the pasta did not take away from the end result. I am not one to grow complacent about my quality of play during Magic games, not while I still find myself making suboptimal decisions every event. However, now and then I can look back on interesting situations where I, perhaps by accident, made the unintuitive yet solid play. My coolest play at the invitational was when my opponent cast a Hostage Taker. He had the option to confiscate my monument but took an Aviary Mechanic, in order to recast his Hostage Taker next turn. Fearing the theft of my monument, I played a Cloudblazer as a sacrificial lamb in the hopes of spiking my opponent’s interest. Meanwhile, it would be an efficient turn advancing the board and my hand while the monument lasted. Still, it hurts a little inside to offer your opponent your Cloudblazer entering their battlefield. In the end it paid off: I kept my monument and it even drew me into the Essence Scatter that eventually would counter my Cloudblazer. How is Gentry doing? Personally, I really enjoy playing Gentry right now and, as mentioned above, I still enjoy this deck after many months. A lot of people play Gentry and seem excited by it, people still try new strategies and combination of cards and I do think that there are some underplayed cards/archetypes. This leads me to believe that Gentry is doing very well. There are clear cards and strategies you need to take into account when building a deck and sideboard but things look to be in balance.